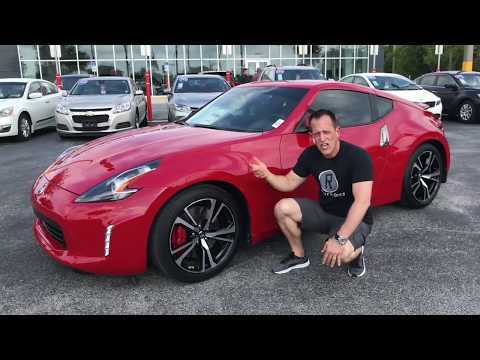 Following on from an illustrious line of cool and desirable Z sports cars dating back to the 1970s, the 2-seat 2018 Nissan 370Z -- available in Coupe, Roadster and track-ready Nismo styles -- wears its years well. Thanks in no small part to Nissan's build quality and reliability, plus a modern take on a classic look. How I feel about my 2018 370z. Car is amazing, even over large distances. Seats are very comfortable. Stock exhaust sounds great but I did upgrade it. It is a pretty quick car, and has the options to come in manual which a lot of cars do not. I enjoy the driver oriented dash, as it is angled towards you. The most important thing is that it is an extension of who I am. It is reliable, fun and will always get the job done. I've always had Nissans and always will. I absolutely love the style of my 370Z. It is compact but there is enough room for me to be comfortable. It's sleek design and under the hood power make it a fast car to drive around. The handling is also amazing because of It's lower suspension.